Sorry, but this item is temporarily unavailable—check back soon to order your 2020 calendars! Keep your sales growth holding steady! Encompasses the charm of the nostalgic Farmer’s Almanac in calendar form with whimsical gardening pictures and useful anecdotes. Beside the images are important dates with gardening tips and folklore as well as moon phases, famous quotes and holidays. Features a 13-month spread from December to December. Your company information is featured on a strip along the bottom of the calendar. Spiral binding allows them to easily flip through pages and change the display. 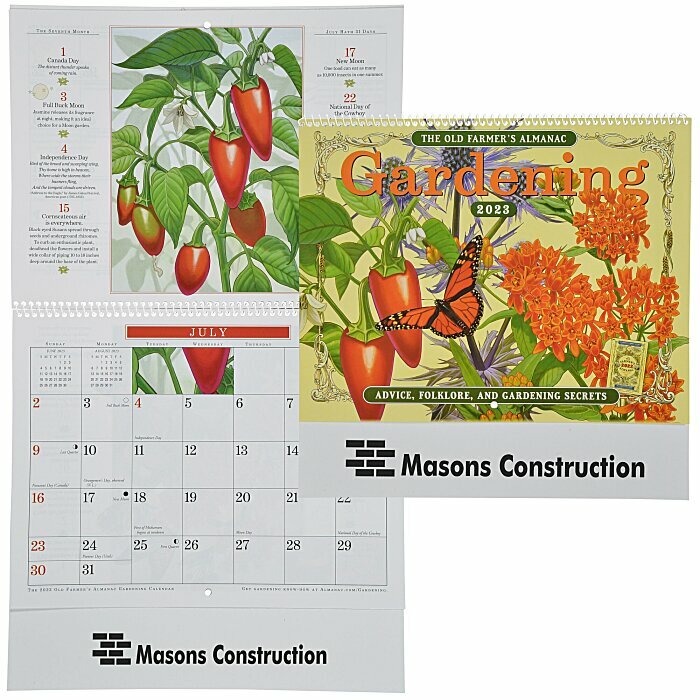 Give out these wall calendars as an end-of-the-year perk for customers with year-round advertising for you! If you would prefer a stapled binding, see item #106824-STThe Old Farmer's Almanac Calendar - Gardening - Stapled. Size: 18-1/4" x 10-1/2" when open. Your price includes a black imprint on the bottom of the calendar.